Join the Department of African American & African Studies (AA&AS) in celebrating its 50th anniversary, AFRO|50 Black Studies and Protest at the University of Minnesota and Beyond. 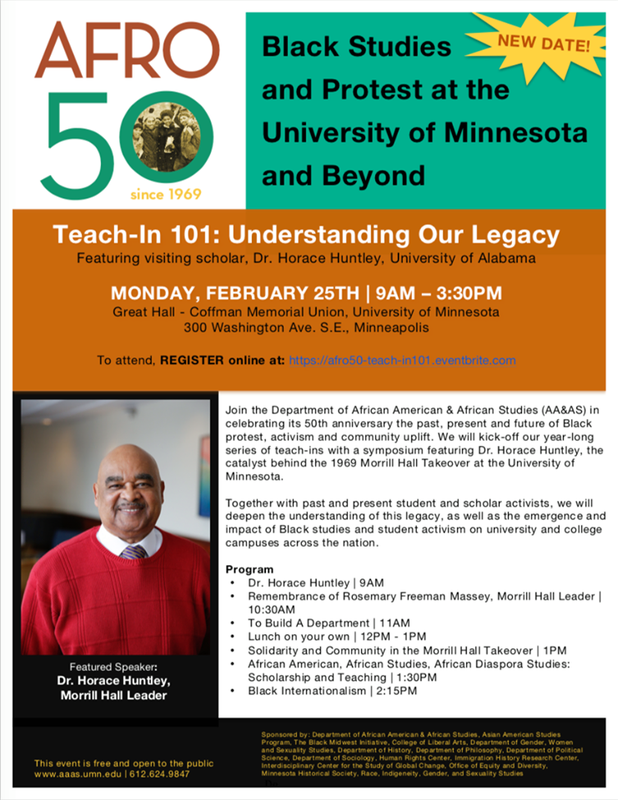 We will kick-off this year-long series of teach-ins examining the past, present and future of Black protest, activism and community uplift starting with Teach-In 101: Understanding Our Legacy on January 29th, 9AM – 3PM at Great Hall, Coffman Memorial Union, University of Minnesota. At this teach-in we sit down with former student and community leaders to explore the legacy of the 1969 Morrill Hall Takeover and the emergence and impact of Black studies and student activism on university and college campuses across the nation. This event is free and open to the public event. To attend, register by clicking on the link.